This would be a pretty dessert on the table of any dinner party… or a no-fuss, no-crust Thanksgiving apple “not-pie.” But it’s equally perfect for a cozy Sunday when you’re too lazy to leave the sofa in between marathon-ed episodes of Mr. Selfridge. Don’t tell me what happens, we’re 3 episodes from the end, and we’re pretty obsessed. But we had to eat, and this was fast enough to quickly to whip up. (It just tastes like it should have taken longer). Feel free to scale it for a crowd, but I love a dessert that’s easy to to make a small amount of, just for 2. Make your crumble topping by crushing the crumble ingredients together. I placed everything into a plastic bag and used a wooden kitchen mallet to crush. Then I used my hands (from the outside of the bag) to distribute any excess clumps of butter. Don't over mix, stop when it's a coarse crumble. Set aside. 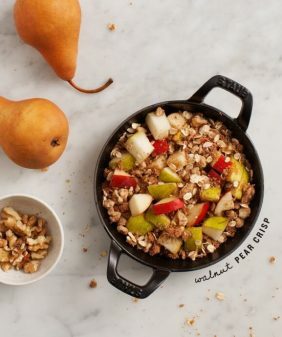 Heat oil in a small skillet, add apples, a squeeze of lemon and a drizzle of maple syrup. Stir to coat and continue cooking for a few minutes until the apples just begin to soften. 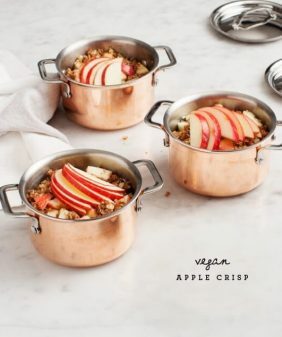 Top the apples with the crumble mixture (as much as you want) and place the skillet in the oven for 8-12 minutes, until the apples are tender and the crumble topping is lightly toasted. Remove from the oven and serve with 2 spoons and a scoop of ice cream. This will work in a larger skillet, double or triple the recipe (depending on the size of your skillet), and increase the baking time. I love me some apple crisp! So good, love skillet desserts, it means you only need to wash up one dish! I love your pictures, so clear and bright. 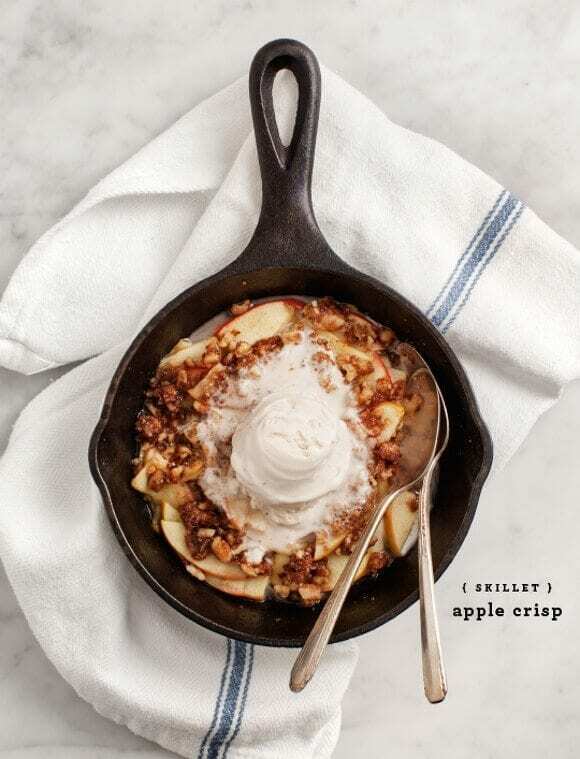 That photo is honesty the prettiest presentation of apple crisp I’ve ever seen! LOVE this recipe! 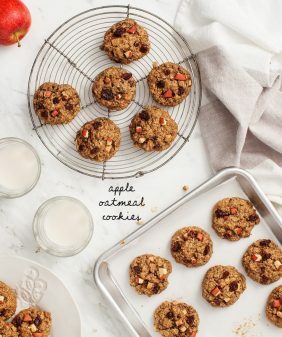 What kind of apple(s) would you recommend in this recipe? I like gala apples, sweet & crisp… a little tart but not overly so. this sounds and looks like heaven in a skillet. must try! What a great way to end any meal! Made this last night and it was the most simple preparation and delicious results. I love the oat-free crumble topping. 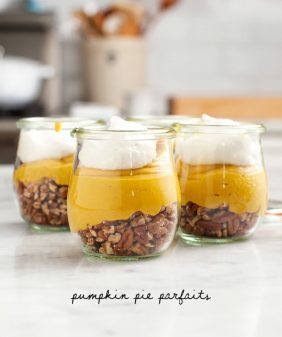 This fits with all seasons since fruit can easily be swapped, so this will be my go-to dessert when I want a quick dessert for me and my husband! Thank you! the courage to go ahead and give you a shout out from Lubbock Tx! thank you! I’m so glad you took the time to finally comment :). Thanks for reading! 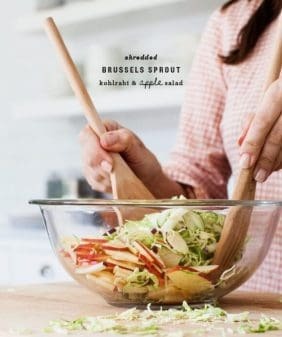 i am making this now and loving it already from the delicious smell and yes even the taste test -pre cooked. i did add a bit of coconut flour to the crumble to see what would happen. will post a pic on instagram. the photo you post seems like more than one apple though. i used for in a medium-sized skillet, and winged the proportions for a crowd. You’ll have to let me know how it goes with the coconut flour 🙂 The skillet I used in the photo is really small (5 or 7 inches).